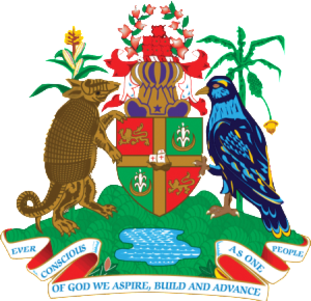 The Coat-of-Arms represents the distillation of a national effort to produce armorial bearings for an independent Grenada, incorporating important historical and indigenous features of Grenada, Carriacou and Petite Martinique, in a design approved by the College of Arms. The National colours of Red, Gold and Green, which comprise the National Flag, are used on the shield with the same symbolism attached to them. The ship Santa Maria at the centre point of the shield and Gold Cross represent Grenada’s sighting by Christopher Columbus, and our continuing link with yachting and tourism. The Gold Cross itself is significant of God consciousness which underlines the national effort. The Lion is the first quarter of the shield, and repeated in the fourth, symbolises strength, and the unswerving determination to face the challenges of nationhood with courage and resourcefulness. The Helm is a royal helm, a gold helmet facing front and having seven gold bars across the visor, the interior lined purple. A star symbolic of our hopes, aspirations and ideals is placed to the forefront. The crest is made up of seven roses, representative of the seven parishes and set between the two sprays of bougainvillea, the national flower. 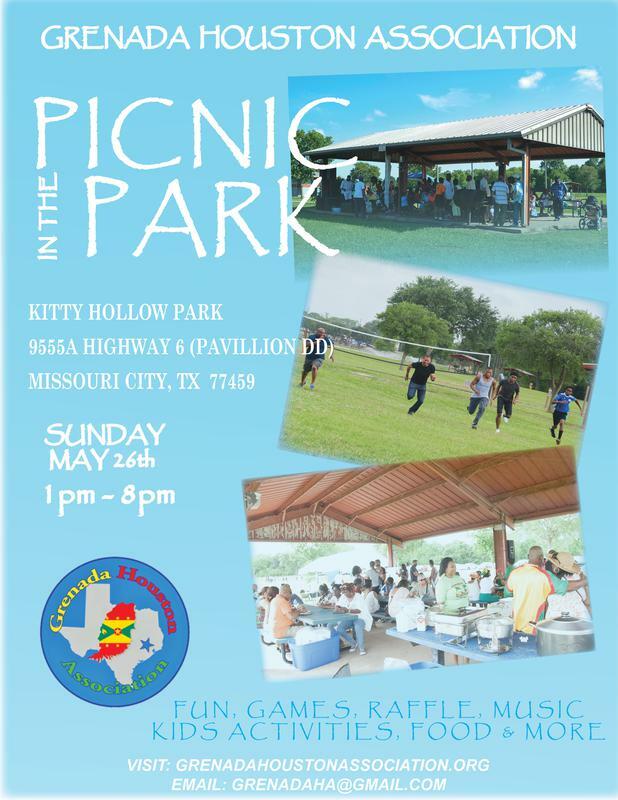 The supporters are, on the left, a Tattoo or Armadillo and on the right, the Grenada Dove, representative of the fauna on the islands. 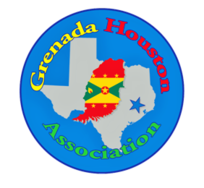 Grenada’s motto, “Ever conscious of God, we aspire, build and advance as one people”, is itself sufficiently eloquent on the subject of those high ideals and principles upon which the nation is founded. The Grand Etang Lake is also represented amid luxuriant green vegetation in the foreground of which is placed a sprig of cocoa, with a ripe pod balanced by a sprig of nutmeg also showing the ripe fruit. Growing from the vegetation on the left side of the shield is a stalk of maize flowering and bearing three ears of ripened cobs and on the right a banana tree bearing a full bunch. The fruits all represent Grenada’s traditional link with an agricultural economy; the cradle of their heritage. ​The Coat-of-Arms or Seal, adopted at Independence, replaced the one introduced in April 1903, with the Latin motto:”Clarior e Tenebris”. The seal appears on all official documents generally in black and white or, on more important occasions, in colour. 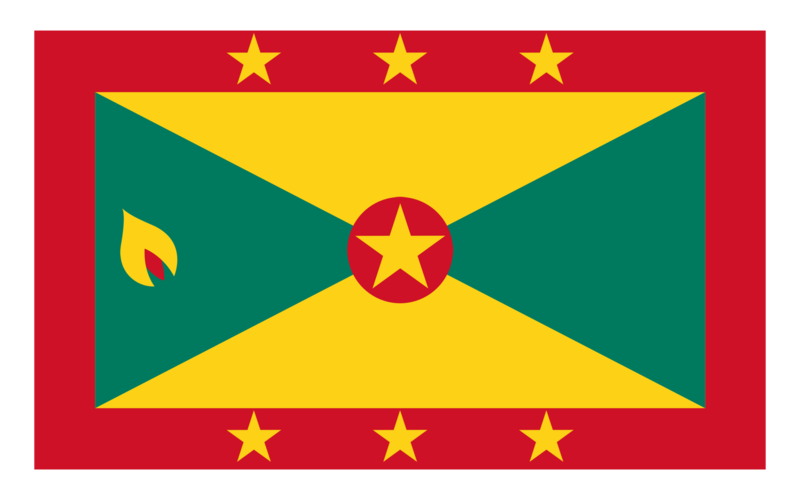 The National Flag of Grenada represents the distillation of a national effort to produce an emblem of a nation that can stand for all time and which incorporates simplicity of form, a pleasing visual quality and, not least, is symbolic of the confidence, hope and aspirations of a courageous people accepting the challenge of nationhood. Represents the fervour of the people, their courage and vitality - their burning aspiration to be free. The red border is indicative of their dedication to preserve harmony and unity of spirit. the warmth and friendliness to their people. the lush vegetation and the island’s agriculture. Represents the seven parishes and the hopes and aspirations and ideas upon which the nation was founded. 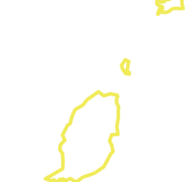 Represents the reputation as the Isle of Spice and its traditional link with the economy. The Flag of Grenada was designed by Anthony C. George of Soubise in the Parish of St. Andrew. Grenada received independence from the United Kingdom on February 7, 1974 and adopted its flag on this day.